If you listen to The Pen Addict Podcast you will hear me constantly referring to the Sakura Pigma Micron that I like to write with. I have always been a fan of this style of art/drawing pen and when the opportunity comes to try out one I haven’t used before like the Staedtler Pigment Liner I jump at the chance. Why do I like this style of pen so much? Not many pens can provide as clean and sharp of a line as drawing pens do. My writing style is one that works well in conjunction with these pens. 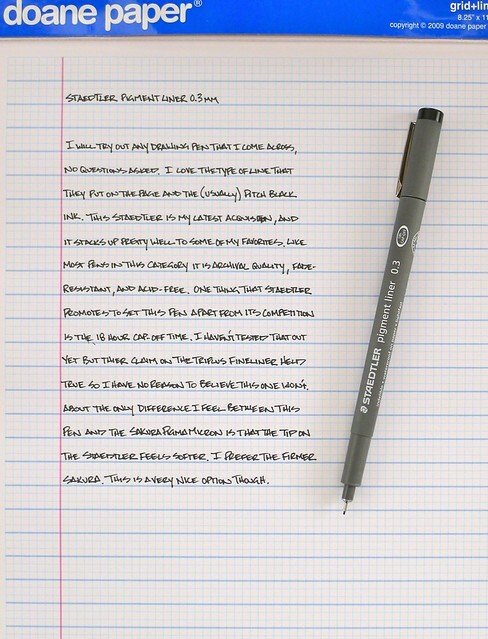 That is an important thing to note: Not every pen is going to fit your style of writing. The challenge is finding the one that works best for you. Comparing the Staedtler Pigment Liner to the Sakura Pigma Micron, they are very similar in many aspects. The barrel size, weight, and feel are very close, and the inks are both dark and have the same archival properties. I do think the tip of the Staedtler is slightly softer feeling than the Sakura, so that is something to keep in mind if you have a heavy hand. Overall, it is another great option if you like art/drawing pens. Most of the brands in this realm are very similar so try a few out to see which suits you the best. Posted on March 9, 2012 by Brad Dowdy and filed under Drawing Pen, Pen Reviews, Sakura Pigma Micron, Staedtler.